This is a place to put all my police and criminals and modern miniatures that will end up in a number of modern scenarios. Other than basing them for a version of Crossfire I don't have any rules in mind or a particular project. 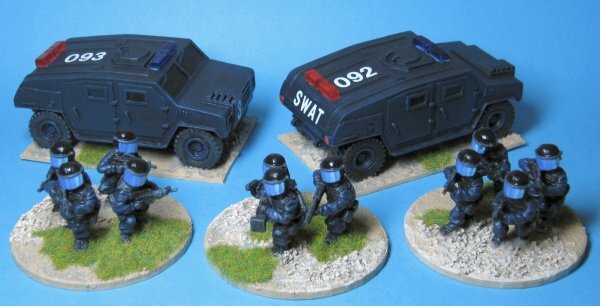 Here are some bases of SWAT for some heavy firepower on the streets. Figures are from Britannia Miniatures, vehicles are from Pardulon. The lettering is done with Letraset rub down letters and the police lights are from a chap on e-Bay. The vehicles will act as secure transport and armed back up units. The figures are based as two fire teams and a door-breaking team with 4 dice and 3 dice respectively in Crossfire terms. The colours used were all from the Foundry range of paints but any range of blues will do. 1,2 and 3 are 21 Sky Blue A.B and C. 4 and 5 are 23 Vivid Blue B and C.
As a final touch I gloss varnished them for added shine. For some added firepower I combined two eM-4 sentry guns and some Warlord WWII German Goliaths to make a pair of remote controlled guns. Here's one with some figures to show the scale. With the addition of some Black Cat Bases robot tops to another pair of GoliathsI have some bomb disarming robots too. 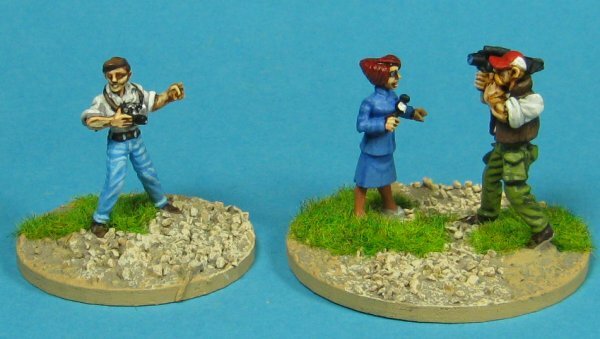 A couple of sniper pairs from Westwind Productions. 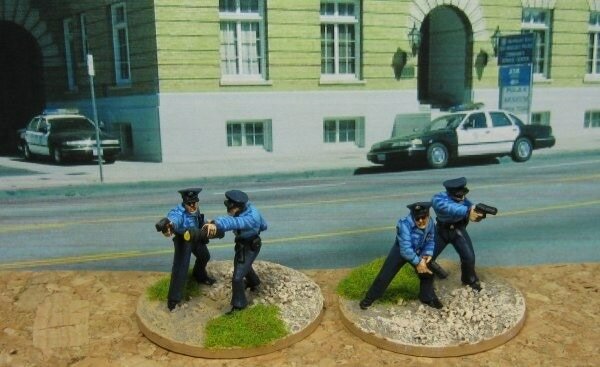 I'm basing my Police in pairs on 50mm bases and giving them 2 shooting dice so they can pin and suppress but can't kill on a single fire action. Any suppressed criminal base contacted by a Police base will be automatically arrested. They will find it hard to winkle bad guys out of cover but that's what SWAT's for. Obviously all this may change before the final version of the rules. Here are some Patrolmen, Detectives and Highway Patrolmen. Currently having a little difficulty finding Police vehicles in a suitable scale. I've decided that 1:43 vehicles are way too big (I'm so fickle) so I'm looking for 1:56 or 1:60 but may drop to 1:64 just for the convenience. Reinforcements for the hard pressed champions of law and order int he form of some patrolmen from Black Cat Bases. 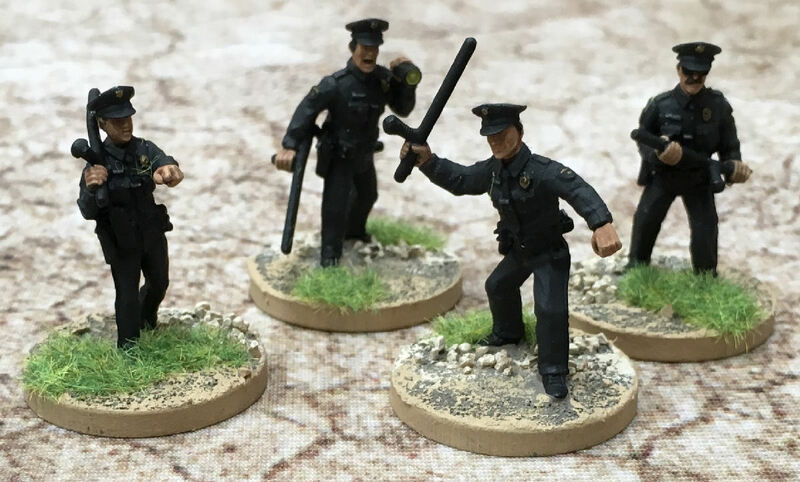 A load of painted police I bought off eBay. Harry Calahan invokes fear, any stand that wants to shoot at him must first make a willpower roll (this is the same as rallying from pinned). Passing the roll lets the stand shoot, failing means it goes to 'no fire' if it was attempting a reaction shot. If a stand belonging to the phasing player fails then the initiative swaps as usual. Harry is immune to fear effects from others. He gets 4 shooting dice because he uses a .44 magnum, the most powerful handgun in the world and, even through a wall, it will take your head clean off. Harry ignores 'pin' results like all heroes. Harry acts as a +2 PC for any law enforcement stands rallying within a large base depth of him (60mm). He adds +2 in Close Combat in addition to other leader bonuses that may be applicable from others present. Harry may not organise or contribute to crossfires (he works alone). Harry requires a roll of 3+ to recover from being suppressed and receives no bonuses from any other stand or leader for rally rolls. 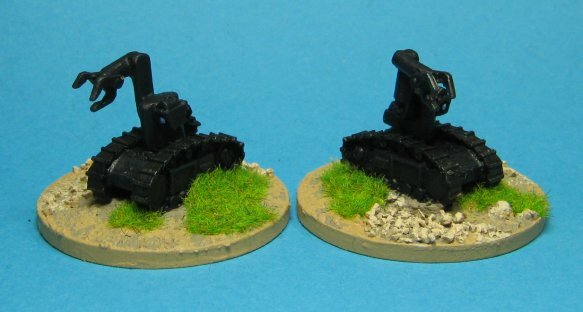 I ordered some SAS from Chiltern Miniatures but they were horribly blocky and very big. There doesn't seem to be any way of knowing which Chiltern figures are usable and which aren't unless you actually look at the lead at a show unfortunately. 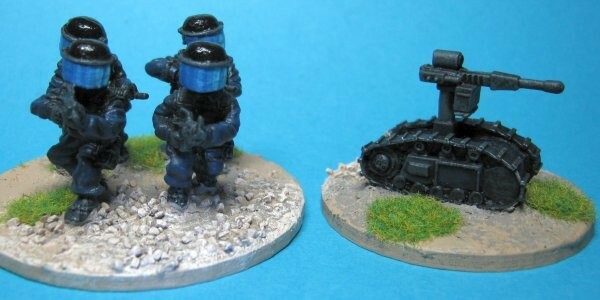 Anyway, I replaced them with these figures from Rebel Minis which aren't SAS, and aren't the best sculpts. They are, however, decent enough, cheap and arrived very, very quickly. They didn't take long to paint either. I have four assault pairs and two snipers. I've based them all on command bases (40mm) to allow them to operate in small rooms and corridors but I've kept to my standard outside basing scheme because they'll see action elsewhere. I was sent some figures by Urban Beat Miniatures, two of which were SAS so I've added them to the mix. Lovely figures if a little slight for my tastes but they mix well with the SAS I already have and, since they're just black and a drybrush the fact that I can't manage the small details doesn't show. here they are with some hostages from The Assault Group. 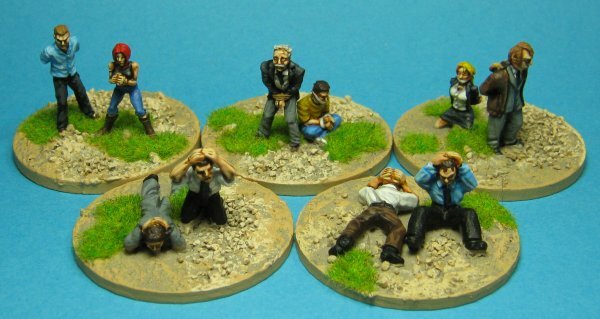 Here are some more hostages, mainly from Hasslefree Miniatures, the figure in the anorak is from Gripping Beast. The seedy underside of any city is home to a variety of unpleasant types, among these, the members of the local crime family rank as perhaps the most dangerous. The first of my orgaised criminals is Marsellus Wallace. Marsellus is a Clix Kingpin figure, his men are KGB and Gangsters from Copplestone Castings. Jules and Vincent are his elite hit men, a cut above the regular heavies. 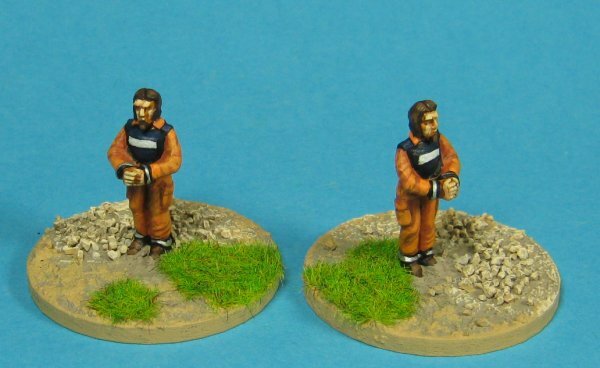 A pair of high security prisoners being escorted made by Rebel Minis. 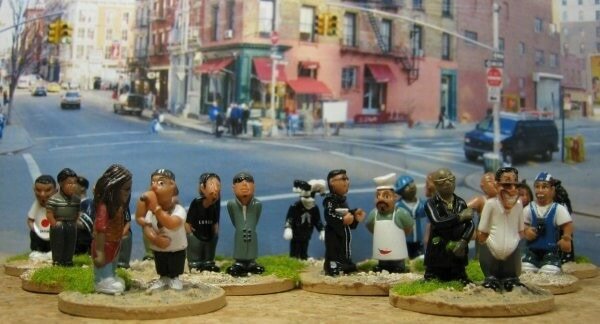 I have plenty of Gangstas thanks to their recent popularity with figure manufacturers. I've started by re-basing my Thugz onto 60mm bases in threes. They will have 3 shooting dice since they're heavily armed. Working around civilians is a constant worry for the Police and other Law Enforcement troops. Groups of bystanders can block fire, become hostages or be put in danger in a number of ways. Constant news coverage and roaming camera crews mean each incident is captured for posterity and it always seems to be the fault of the Police not the criminals. 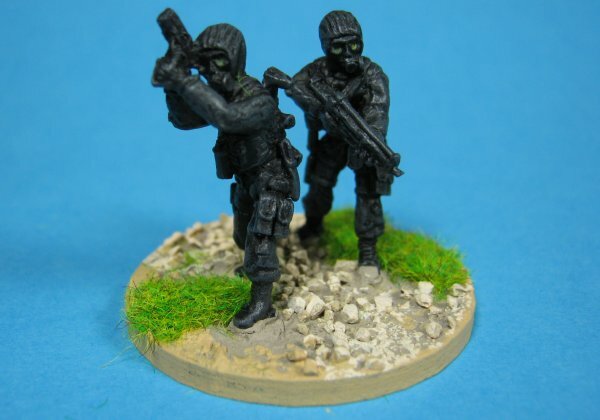 I have several civilian figures to paint up, to begin with I have re-based my Mini Homies in pairs on 40mm bases which are used to indicate if an area of terrain is occupied by civilians. Civilian and bystander bases also block fire for Police units but not for criminals. The Press often get caught up in the action too. these are from a Superfigs civilians pack. These are also Superfigs civilians. Many of my ostensibly separate projects seem to merge together in a world that is mostly like ours but populated by various pop culture characters and settings. Recently I've found myself finding reasons to include various personalities, both good and evil, from more fantastic sources and insert them into otherwise perfectly sensible modern or near future settings. Among these wandering adventurers have even appeared some superheroes. 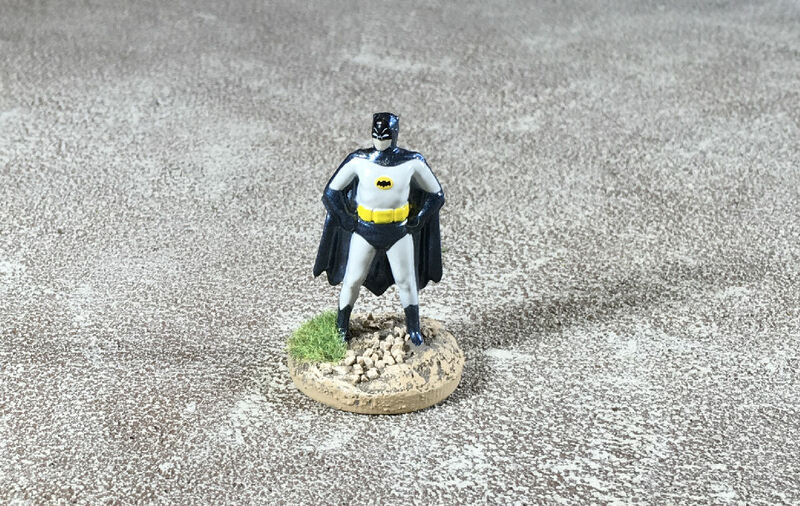 Originally I started with Batman, an ordinary man with a bit of a chip on his shoulder that could conceivably happen and a few similar heroes for Weird War II but, as often happens, my interest grew and weirder people arrived on the painting table. 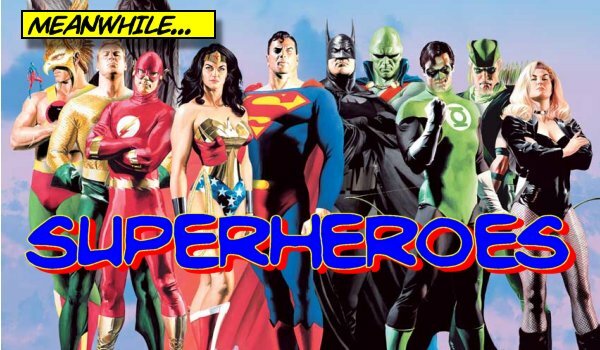 I've decided to collect all the superheroes here, links will point you to their particular settings as we go on. 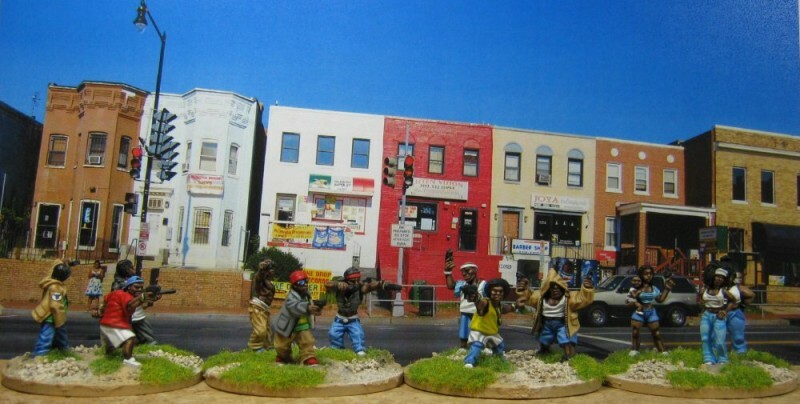 Luke Cage (a Clix figure) will be defending the ghetto in my Drug Wars setting. The Freakish Four will, having been changed irrevocably by Cosmic Rays whilst in orbit, probably emerge from their crashed capsule in my Invasion of the Saucer People game and Superman will almost surely stay on the shelf as he's a bit of a game winner if he shows up anywhere. 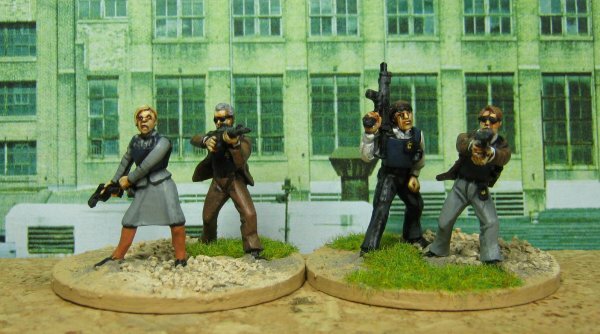 The Freakish Four are available from Black Hat Miniatures. 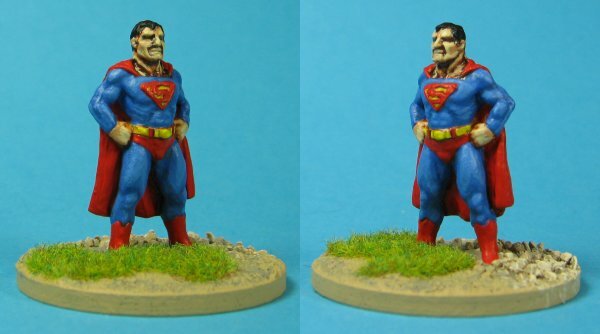 Superman was a limited edition from What The?! Miniatures. 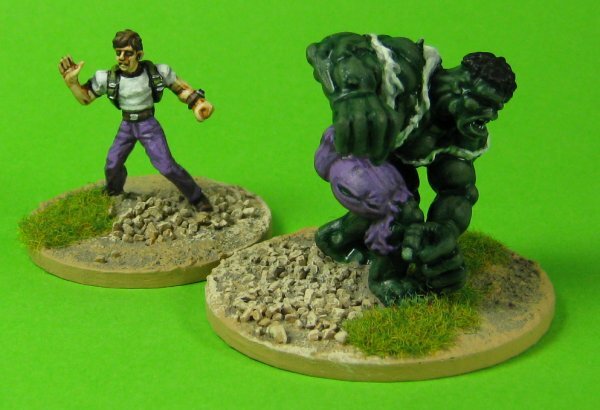 A clix Hulk and a Superfigs civilian to represent Dr. Banner in his 'walking the Earth' role. 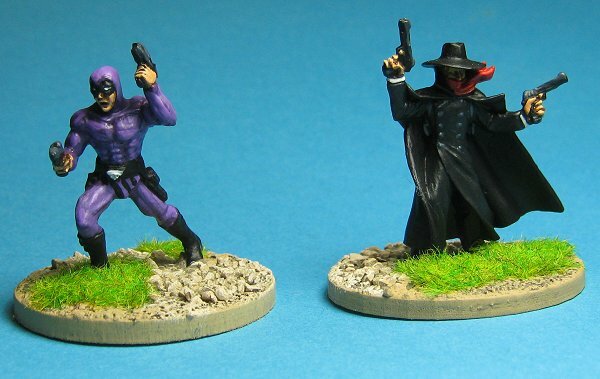 The Phantom (Avolak Castings) and the Shadow (Reaper Miniatures). 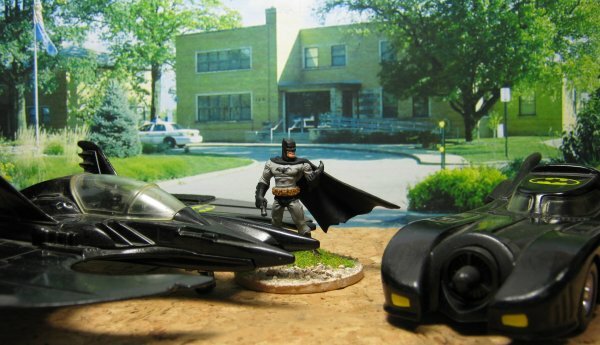 The two Batman figures are clix miniatures. 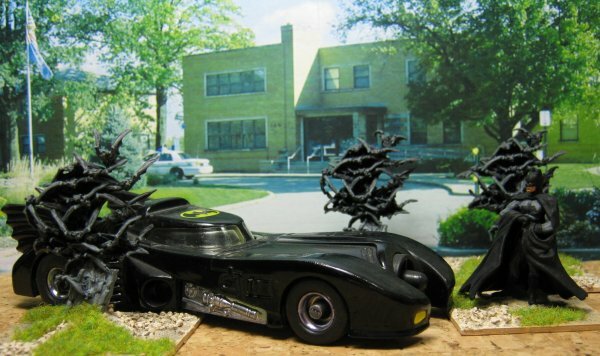 The vehicles are diecasts and the bats are from Reaper. 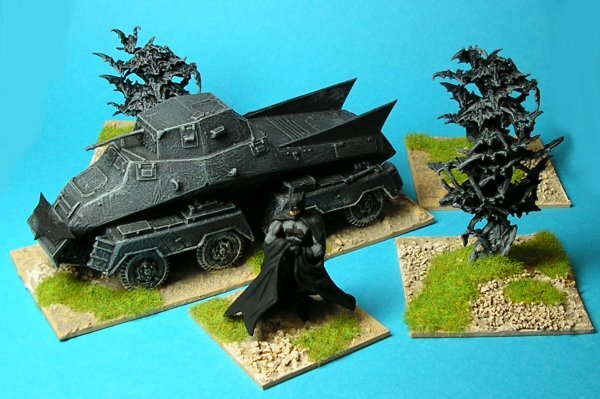 The WWII version of the Caped Crusader uses a modified German Sd.Kfz 231 Achtrad (from BEF Miniatures) as his wartime Batmobile. He can also summon bats which appear in thick clouds that act as smoke and to enemy lines of sight. 1966 Batman. A metal toy figure.